Discerning buyers don’t purchase their wedding and engagement rings from just any location. Goldsmiths has the expertise to help you choose the right engagement ring or wedding band. Goldsmiths is the official wedding band and engagement ring headquarters for the Greater Reading, PA area. We have helped many couples make the important decision to choose the perfect engagement ring and wedding bands for their special day. People often have questions when purchasing an engagement ring. It’s one of the most special purchases you will make in a lifetime and you want to make sure it’s perfect. We take the time to explain the different characteristics of gemstones and settings. Our jewelers will show you diamonds of different sizes, clarity, and cuts so that you can feel confident you are making the right decision. No other jeweler in the area has the selection or expertise Goldsmiths has to offer, which makes Goldsmiths the first choice for couples getting married. 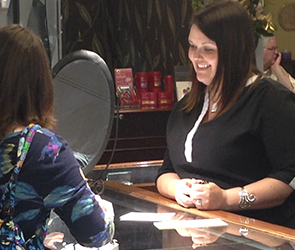 At Goldsmiths, we want to ensure every one of our customers makes a knowledgeable purchase. Whether you want the largest diamond, the highest-quality diamond, or a balance of diamond size and quality, we’ll make sure you have a full understanding of what you’re buying so you’re sure to make the right decision. Stop by Goldsmiths today for a free consultation. Choosing the right ring can be challenging if your keeping the engagement proposal a secret. Goldsmiths can provide you with the advice to make the right decision without her (or him) knowing a thing!